When you’re living though a cold, damp winter in Dublin, a quick getaway to Barcelona, Spain, in December is a real treat! Actually, in my mind, a trip to Barcelona no matter the time is AMAZING. This was our first time visiting Barcelona and we only had two days to explore the city. Before we left I did a little online research so I had an idea of what was available to do in the city and of interest to our family (our kids are 7 and 10). When we landed in Barcelona on December 26, it felt like an Irish summer. I kid you not. The locals were bundled up in parkas, but my kids were like, “WE FOUND THE PROMISED LAND AND IT’S WARM!” In case you’re wondering what my kids call warm these days – high 50s Fahrenheit. All the loose plans involving indoor attractions were scrapped. Instead, if there was a theme to this trip, it was let’s stay outside as long as possible! Even if the wind kicks up! And it did. – Their breakfasts are super hearty and delicious (eggs, potatoes, meats, breads, cereals, fresh juice, fruit, etc.). – Kids get a present at check-in. This time it was a lollipop and a Minions bracelet. – Play area for the kids with toys and video games. – This Novotel is located next to Glories Shopping Center with shops and restaurants and around the corner from a metro and tram station. – For all the stuff we ended up doing, we had to either walk or take the subway. Granted, the things we wanted to do were spread all over the city. It would have been nice to have been on the beach, but that’s just personal preference. 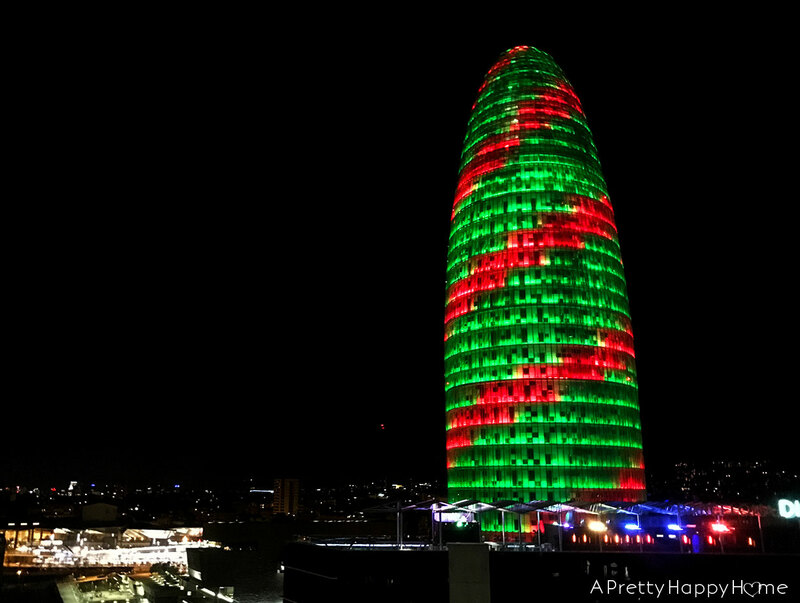 We didn’t have a beach view, but we did have a view of Torre Glòries lit up at night! I honestly cannot tell you the names of any of the restaurants where we ate. They all ended up being hole-in-the-wall establishments that looked sketchy, but had amazing and inexpensive food. One night we ate sushi from a huge supermarket store – CarreFour. Honest to goodness, the food selection in that grocery store was amazing. If you buy loose fruit though (ones you bag yourself) make sure you weigh it before you take it to the checkout counter. Live and learn. Oh, and because one of my children would rather starve than eat sushi, he got a McDonald’s Happy Meal. Don’t judge. Sometimes travel is all about survival. Plus, it’s sort of interesting to see what’s in a Happy Meal in various countries. In Spain you can get tomatoes instead of fries. That’s totally what my kids did! HAHAHAHAHA! Not! Just wanted to see if you were paying attention. 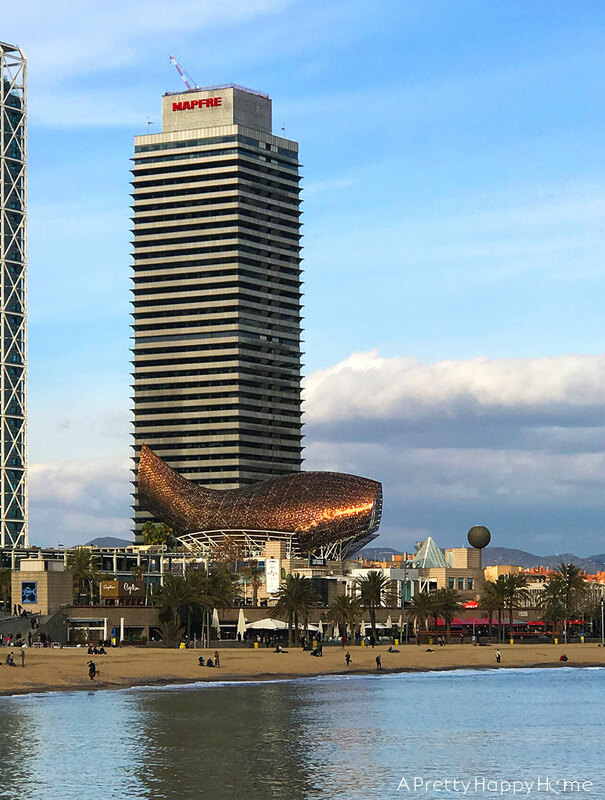 You can purchase a Barcelona Card that includes free admission to many attractions AND all your public transportation – even the train from the airport. Generally speaking, these type of tourist cards can save you a few bucks if you’re hitting a lot of attractions. It’s best to price things out before you purchase one though. We ended up purchasing a Barcelona Exrpess Card (2 day), which gave us the transportation option and discounted (not free) admission to some attractions. While we did use a lot of trains and buses in two days, we didn’t end up using any of the discounts the card offers. I’m not sure if we came out ahead or not on that deal, but it was nice not to have to worry about train and bus tickets all the time. If you do buy a Barcelona Card there is a small discount for purchasing it online in advance of your trip. You will receive a voucher that can be redeemed at various tourism offices for the card. It was slightly confusing/frustrating to find the tourism office at the airport. That’s because we didn’t deplane into Terminal 1 or 2, so we had to go on the search for the tourism office. Also, you are supposed to print out your voucher prior to redeeming it. However, enough people don’t do this in advance that the customer service agent handed us an email address where we forwarded our online voucher and he printed it out for us. One of the first things we did was find the beach! Barcelona is located along the Balearic Sea, which is part of the Mediterranean Sea. The sand had a coarse texture and was a medium-brown, almost clay color. 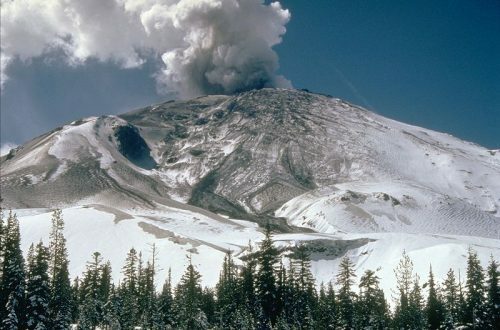 I’m not sure why, but I found that tidbit interesting. No one was in the water when we were there, but plenty of people were hanging out on the beach or walking the boardwalk. There are restaurants, playgrounds, bathrooms and feet washing stations all along this area. Sagrada Familia is one of the most famous landmarks in Barcelona. The temple is famous for different reasons. 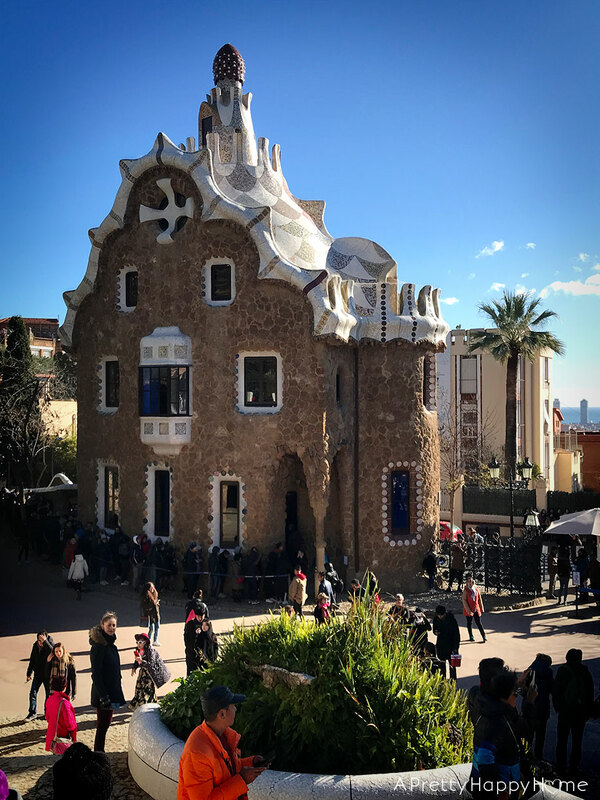 First, its architect is the famed Antoni Gaudí. As a result, its design is definitely unique. Second, the temple has been under construction since 1882. 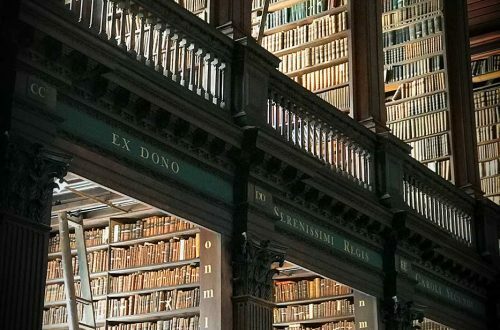 That’s 135 years of construction – give or take some work stoppages here and there. According to the temple’s website, construction may be complete by the first third of the 21st century. So by 2033. Maybe? If you’ve read Dan Brown’s latest book, Origin , then you’ll know Sagrada Familia was featured pretty prominently in the storyline. I really enjoyed that book, by the way. 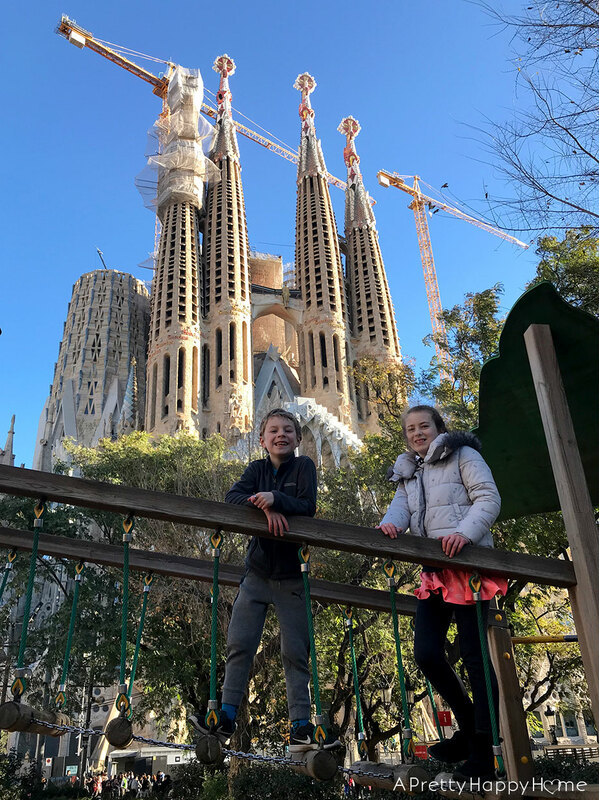 Partly because of the book, but mainly based on what we already knew about Sagrada Familia, this was the one “adult” thing we were going to do while in Barcelona. We got to the temple just after its opening time and ALL the tours for that day were sold out. Learn from our mistake! We should have either gotten there earlier or bought tickets online prior to our trip. It looks like they sell tickets up to two months in advance. Kids 10 and under are free. I think we could have waited in line for general admission tickets, but the line was crazy and the process confusing. For ticket tips, this website was helpful after the fact. My kids did not feel sorry about our misfortune one bit because do you know what’s right outside of the Sagrada Familia? A playground. It is a pretty epic setting in which to play. Park Güell is considered to be another of Antoní Gaudi’s masterpieces. It was originally intended to be a residential development and work started in 1900, but the project was scrapped by the owner, Eusebi Güell, in 1914. The land was sold to the City of Barcelona and became a park in 1926. Park Güell was declared a UNESCO World Heritage Site in 1984. Tickets to the ‘Monumental Core’ of Park Güell are available online up to 3 months prior to your visit. We were able to walk up and buy tickets, which are sold in time bands. As an example, we arrived at 11:15 and were able to purchase tickets for entrance to the core between 12 and 12:30. I don’t know if this would be the case during peak tourist season. You can stay as long as you want once inside, but you have to enter within the time on your time band. What did we do while we waited for our entrance time? Well, most of Park Güell is a large public park with trails, picnic areas, restroom and a playground. You don’t need a ticket to visit a public park! So, we played on a playground. We walked the paths and explored Gaudi’s handiwork. It really does boggle your mind to see the intricate paths, arches, benches, etc. that his vision created. I’ve never seen anything like it. 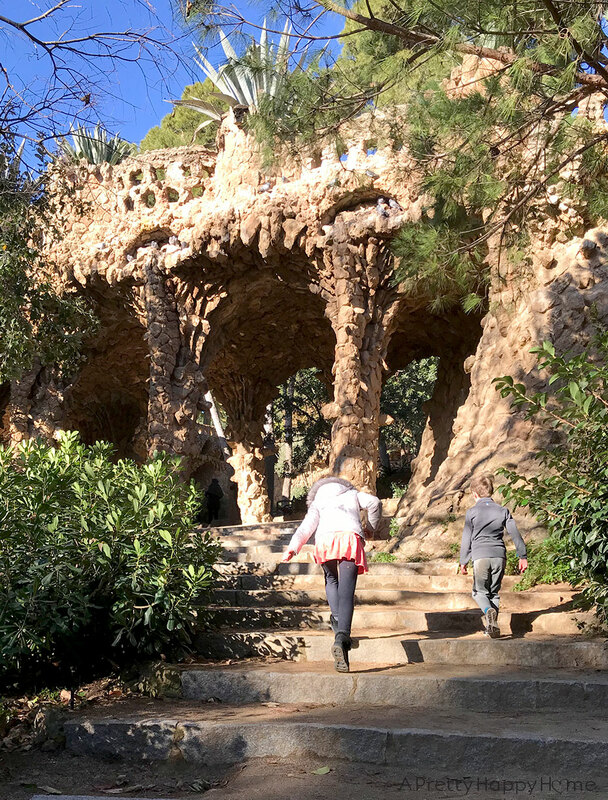 Park Güell is located on the top of a hill, so when you walk the paths you will be rewarded with impressive views of Barcelona and the Balearic Sea. Just keep climbing…you’ll get there! 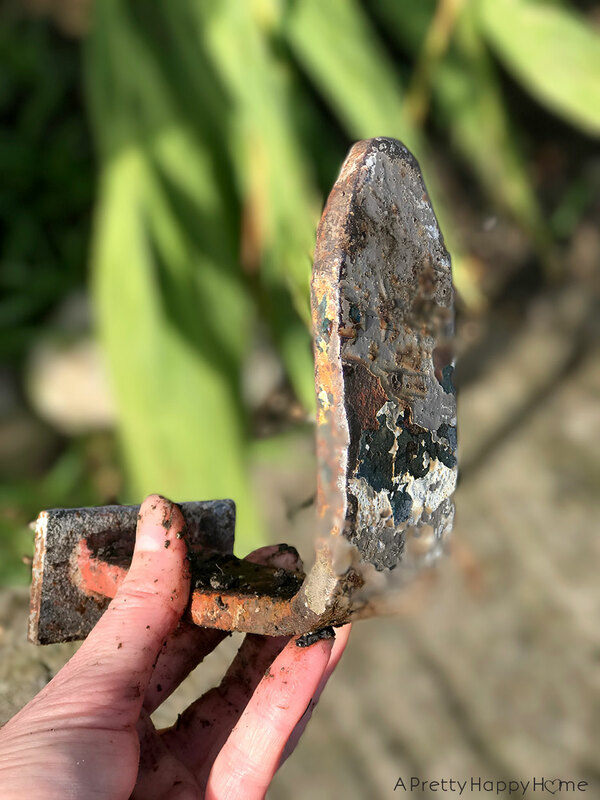 Once inside the Monumental Core – the ticketed area – we saw more of what is in the public park. There’s also a Dragon Stairway, the HypoStyle Room, Nature Square (under rehab when we were there), gardens and the Laundry Room Portico. Plus, you have access to the Porter’s House, which is now a history museum. The wait to get inside the museum (below) was 45 minutes. There was no way my kids were going to cheerfully handle a 45-minute wait for something that doesn’t involve a rollercoaster. That’s my reality and the museum wasn’t a high priority for me anyway. If I would have realized the wait was going to be 45 minutes for the museum and knowing that you can sort of see some of the things in the Monumental Core from the free areas of the park, I wouldn’t have bought the entrance ticket. I don’t want to discourage you from buying a ticket though because maybe you’ll get more out of it than we did. 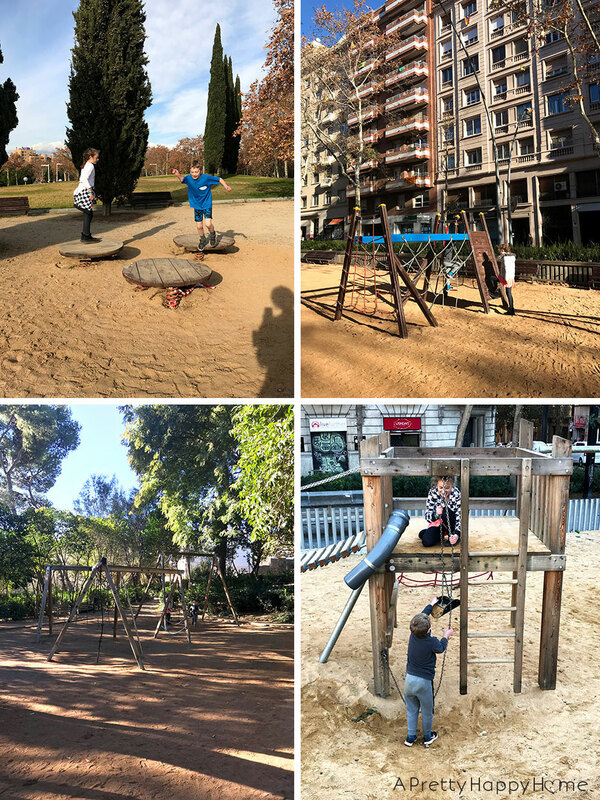 In between our walks to various attractions or walks to the subway stations, we kept stumbling upon public playgrounds. It almost became a running joke there were so many of them! The park situation was definitely a way to motivate our kids to keep moving. From what we saw, Barcelona has done an amazing job of creating outdoor spaces for its residents (and visitors!) to enjoy. 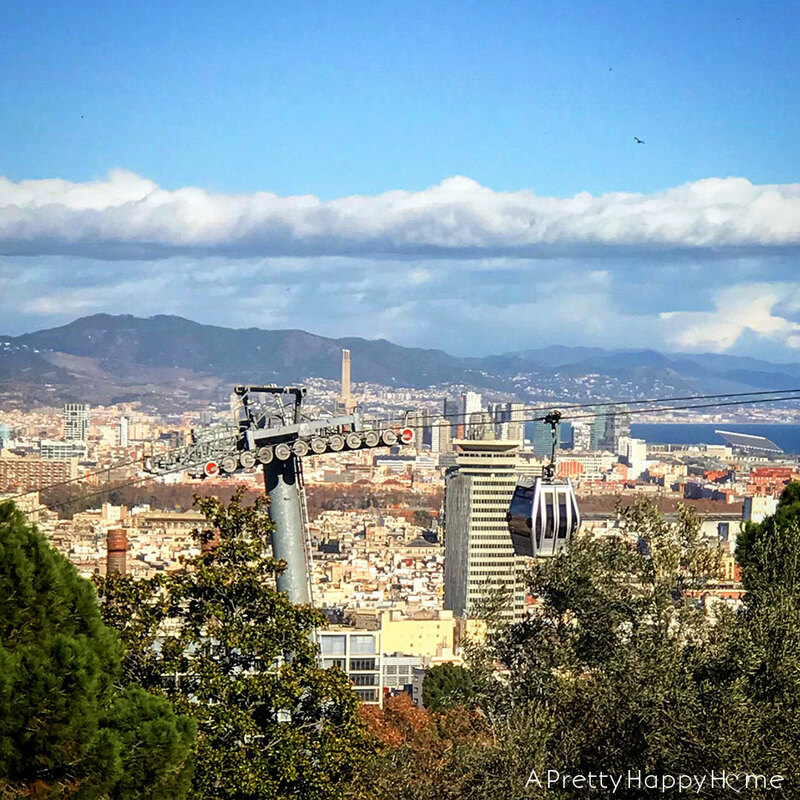 The one thing we REALLY wanted to do as a family in Barcelona was ride Teleférico de Barcelona – the cable car. I don’t think my kids have ever been on one and certainly not in Spain! We set out to find one of the cable car stations only to arrive and realize that it was closed due to high winds. These things happen. You can’t control the weather while on vacation. You also can’t always rely on an attraction to update their website with these type of closures. We were just one of many tourists caught off guard that day. It would have been awesome though! We didn’t let a little cable car closure ruin our day! After all, we got to ride the funicular railway to get there (that was new for us) AND there’s always another park to find! The closest “park” in this instance was the one surrounding Montjuïc Castle (Castell de Montjuïc). 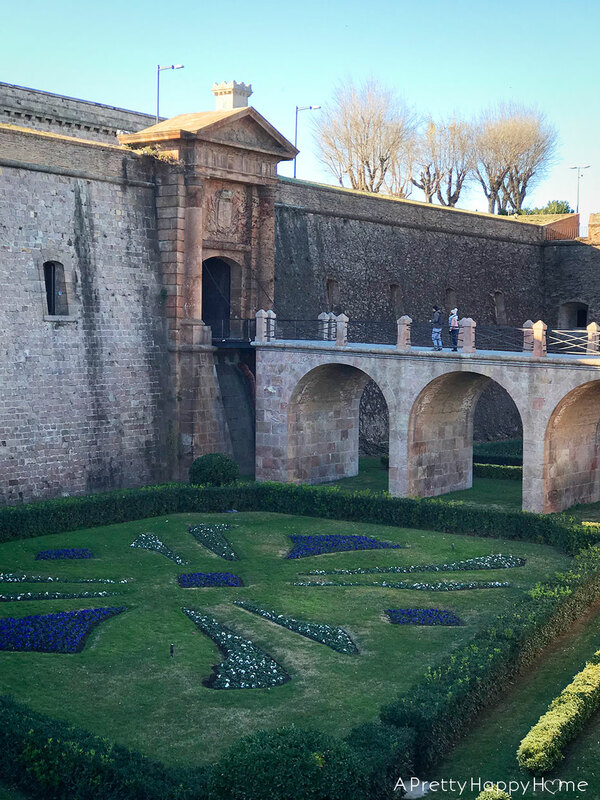 Montjuïc Castle is located on a high point above Barcelona with panoramic views of the sea. The castle site was used as a place to defend Barcelona for centuries. It became a military museum in the 1960s. 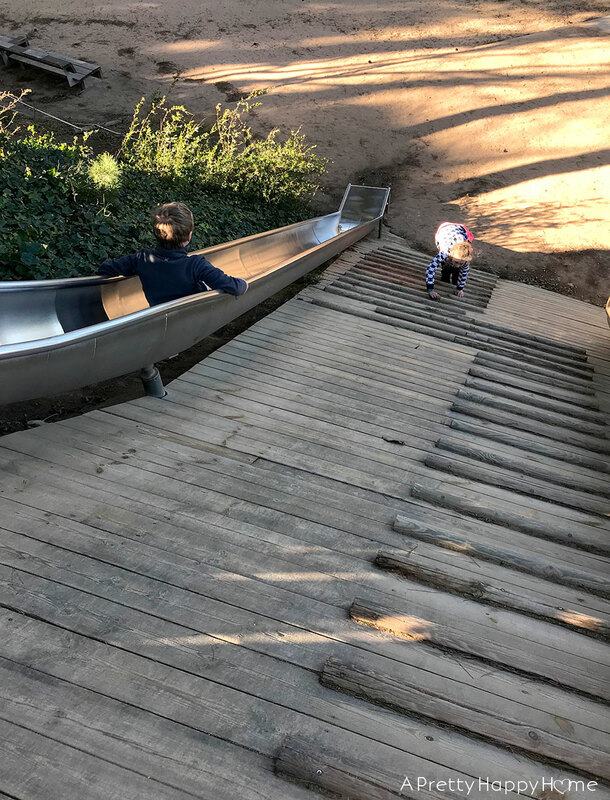 On our hike up the hill to the museum, we found the coolest set of slides. They were as steep as this picture indicates and a clever use of space. We decided not to go into the museum, but the grounds around the castle were gorgeous. We were SUPER glad for our Barcelona Card and the public bus that came every 15 minutes from the castle to take us back down the hill. I don’t think mama the kids would have made it. Later that day our activity trackers showed we had walked 98 flights of stairs – most of those were on our hike UP to the castle. Side note: Also located on the Montjuïc Hill are the stadiums from the 1992 Olympics. You can tour them for free. We didn’t do this, but did go by them and they looked very neat. The stadiums are now used for concerts and sporting events. 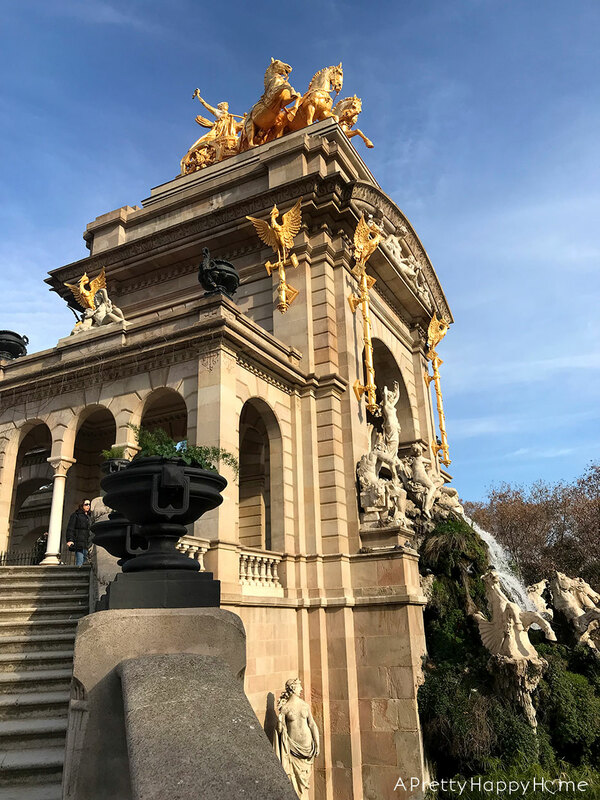 Parc de la Ciutadella is a 70-acre park in Barcelona that is home to the Parliament of Catalonia, Museum of Natural Science, the city zoo and a large fountain. I was told December in Barcelona is orange season and the season did not disappoint. 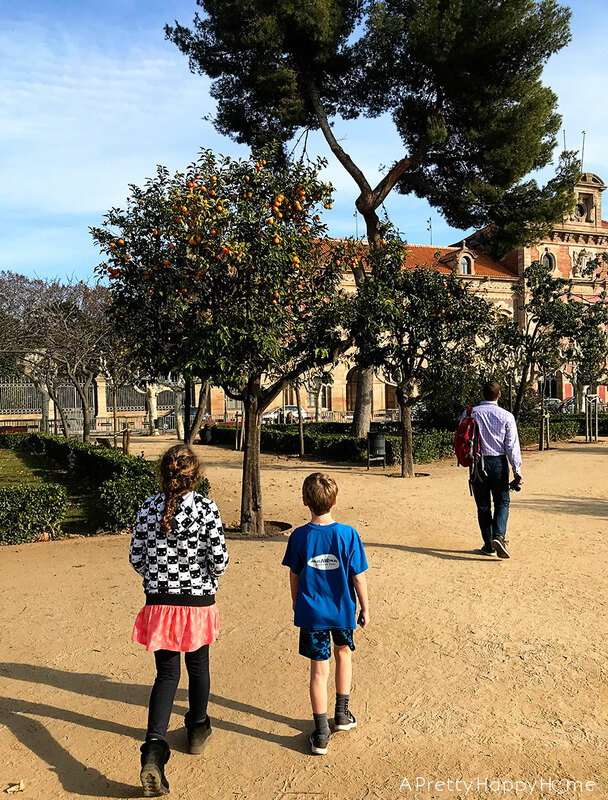 One of my favorite things about Parc de la Ciutadella was all the orange trees. And, no, I didn’t try to pick one. I thought hard about it though! Instead, I bought a big bag of local oranges for Handy Husband to carry around in his red backpack . He was so appreciative of the extra weight the healthy snack. That’s the parliament building in the background, by the way. I will briefly mention that while we saw support for Catalan independence everywhere, we did not see any protests during out quick visit. The other showstopper in Parc de la Ciutadella is the fountain called Cascada. It’s more of a structure than simply a fountain. It was created back in 1881 and then a few years later added onto and embellished to be more impressive. Did we enjoy our time in Barcelona? YES. Definitely. I know there were some hiccups to our visit, but that’s just part of travel. Our attitude determines if it’s an adventure or an ordeal. Some of the things that didn’t happen led to some other cool things that did, so I’ll call that a win! It was fun to experience a place that is so different from most anywhere else we’ve visited. It was also a good opportunity (and a humbling one) to practice our Spanish language skills, which are, at present, very poor. Although, in most cases, people speak English quite well. There were plenty of museums and other indoor attractions that we did not make time to visit with our kids during this trip and that’s okay. Being outside was an enjoyable December treat! P.S. Handy Husband is a fan of this 20L Deuter backpack to carry around our snacks and gear while being tourists. My daughter now wears these Skecher boots in a woman’s size. They have a tennis shoe sole, but the look and warmth of an UGG boot and have been awesome this winter while traveling. Great information on Barcelona! Thank you for sharing your family adventure.